Christmas is an especially good time for giving thanks and for over seven decades the city of Oslo, Norway has been saying ‘thank you’ to the people of Britain in a most unique way. 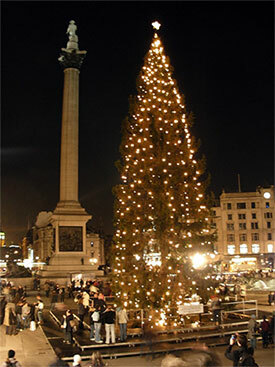 Since 1947, Trafalgar Square has received an annual gift of a Norwegian fir tree as a show of appreciation for the support Norway received from the British during the Second World War. After being invaded by German forces in 1940, Norway’s King Haakon, the royal family, and members of the government escaped to London, where the King was able to establish a government to lead the resistance effort back in Norway. London played host to the King for five years, until Norway was finally liberated in 1945. The King and the people of Norway were eternally grateful to the British and in 1947 presented the first of what would be an annual gift of a Christmas tree to symbolize the friendship between the two countries. The chosen spruce is typically about 50 to 60 years old and over 20 meters tall. Dubbed the ‘Queen of the Forest’, it is usually chosen several years before it is felled and is then specially cultivated and groomed to ensure it prospers to its fullest potential. The cutting of the tree takes place each November, when the British Ambassador to Norway, the Mayor of Oslo and the Lord Mayor of Westminster gather in Norway to attend a special tree cutting ceremony. Afterwards it is shipped to a port in the U.K. before being transported to Trafalgar Square, where it is decorated in traditional Norwegian style with small paper baskets formed in the shape of hearts and 500 white lights. Another ceremony, attended by about 10,000 carol-singing Londoners, then takes place for the lighting of the tree. 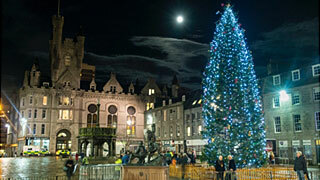 This is typically the first week of December and heralds the start of the Christmas season. 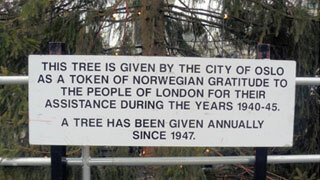 Although the tree from Oslo that stands in Trafalgar Square is the most well known, for a number of decades, several other cities throughout the U.K. have also been the recipients of Norway’s gratitude. Starting the first week of December, the U.K. cities of Sunderland, Newcastle, Grimsby, Coventry, Aberdeen, and the Orkney Isles off the northern coast of Scotland take receipt of Norwegian firs that hail from cities all over Norway. For the last twenty years, Norway has also presented a tree to the District of Columbia. Not an easy task considering that the importation of trees is prohibited by law. At least one year the Norwegian Ambassador reportedly found a tree in Iowa, where the grower was of Norwegian descent. In subsequent years – including this year – the tree, which is now provided by a Norwegian technology company owing to budget restrictions, is reportedly no longer a live tree, but an artificial one. I guess you’d call it a ‘faux fir’.